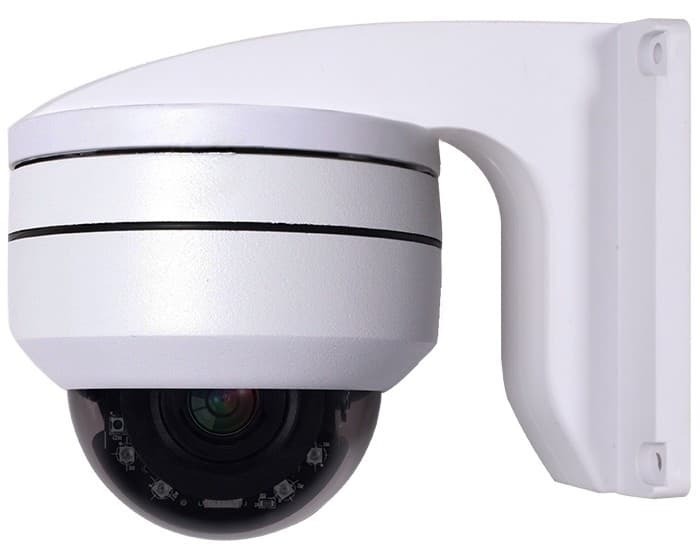 The PTZ-AHD-5 is a 1080p pan tilt zoom camera that supports the following video surveillance formats: HD-TVI, HD-CVI, AHD, and analog CCTV (CVBS). This speed dome camera offers real-time recording in full HD 1080p resolution when utilizing the HD-TVI, HD-CVI, and AHD video modes. When in CVBS mode, also known as non-HD Analog mode, the PTZ-AHD-5 records in 960H resolution (960 x 480). The built-in IR LEDs allow for around-the-clock recording and have an effective illumination range of up to 40 meters / 120 feet. A motorized 2.8~12mm varifocal lens supports an optical zoom range of up to 4x and can be controlled from a DVR. We recommend iDVR-PRO AHD hybrid DVRs. This camera also has digital zoom capabilities. This allows the user to zoom from a wide angle of view to a more zoomed, focused viewing angle with less overview but greater detail. In addition to controlling the angle of view from a DVR via Up the Coax, Coaxatron, or RS-485 protocols, users can also control them from an RS-485 standalone PTZ joystick and remotely via iOS / Android live stream apps for the iDVR-PRO series DVRs. An IP67 outdoor rated enclosure houses the vital components of the PTZ-AHD-5 and protects them from harsh weather, impact, and humidity. Because the housing is compact, this camera can be used for both indoor and outdoor applications. The above color image gives an example of how the PTZ-AHD-5 will look zoomed all the way out (at the widest angle). This image was captured with the 4x zoom lens all the way zoomed in. Zooming in on a specific area allows the user to view it in greater detail. I am the one in the middle. I am standing 24 feet away from where the camera is mounted. The TV in the background is 29 feet away. 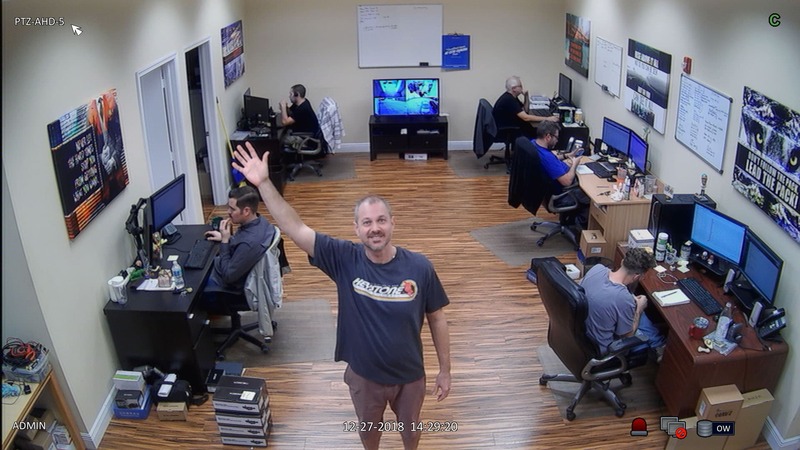 The infrared surveillance image above was captured in the Lantana, Florida office of CCTV Camera Pros to illustrate how the IR night vision performs in a medium-sized room with little to no ambient light. This is the performance users can expect from the PTZ-AHD-5 when used in environments with very little ambient lighting to zero light. 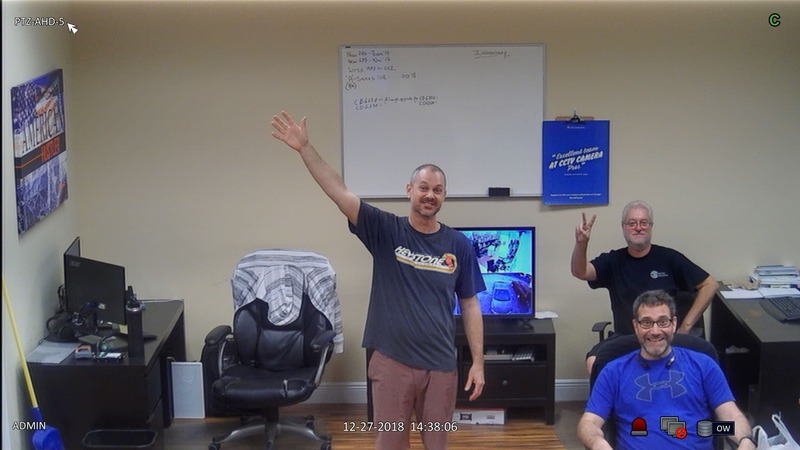 When this camera is connected to an iDVR-PRO and remote access is setup, users can view and control the camera from iPhone and Android mobile apps. Remote access from Mac and Windows DVR software is also supported. 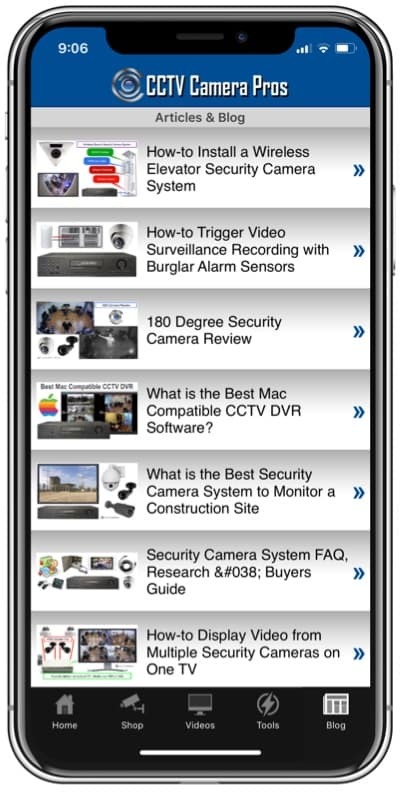 You cam learn about all remote security camera viewing apps here. Above is a sample image of the PTZ-AHD-5 HD camera being controlled from the iDVR-PRO iPhone mobile application. This allows users to conveniently control their PTZ camera from virtually anywhere. 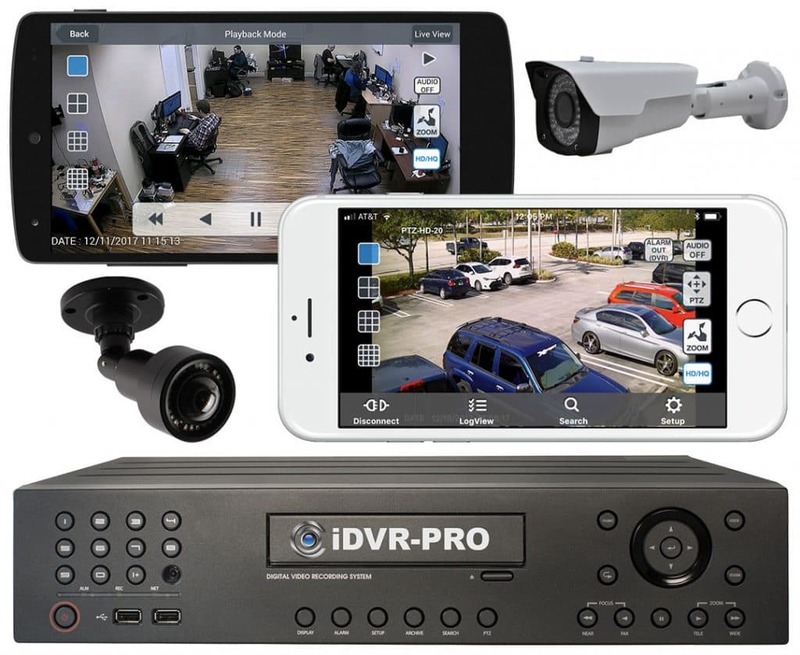 In order to use the iDVR-PRO application and its PTZ control feature, an iDVR-PRO HD security DVR is required. Here is the PTZ-AHD-5 being controlled by the iDVR-PRO Android App. The PTZ-AHD-5 can be mounted directly to a ceiling or eave using the included mount. For users who wish to mount the PTZ-AHD-5 to a wall rather than a ceiling, the optional wall mount bracket is available and provides the user with an easy setup experience. You can find this 1080p pan tilt zoom camera for sale here. 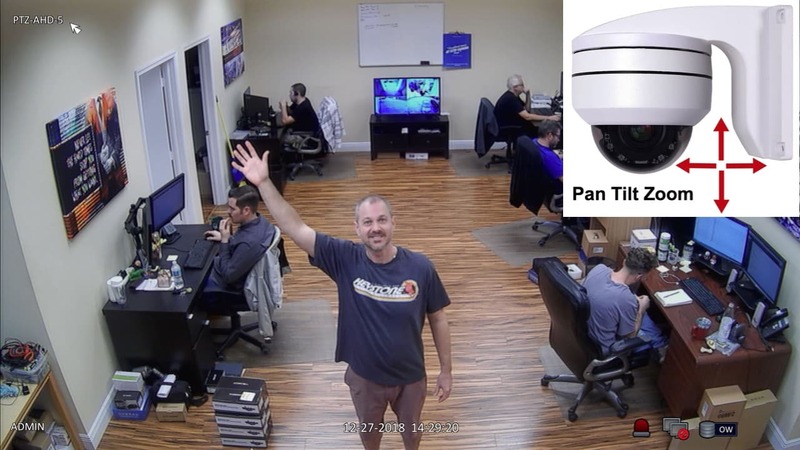 A PTZ camera, also known as a Pan, Tilt, and Zoom camera, is a type of surveillance camera that can be controlled by the user from a DVR, PTZ controller, or PC and mobile live viewing applications. Users can pan the housing from side to side and tilt the lens from top to bottom. In addition to panning and tilting, a motorized lens allows the user to zoom from a wide angle of view to a more zoomed angle of view. This enhances the level of security offered by the camera as it is able to monitor more than one location at a time and can produce the same coverage range as two or more fixed cameras. Does this camera support remote access? Yes, this 1080p pan tilt zoom camera can be accessed remotely from PC and iOS / Android mobile applications as long as the camera is connected to a DVR that supports it, such as the iDVR-PRO4A. A DVR is required for remote accessibility because the PTZ-AHD-5 is a BNC type security camera and does not have the hardware capability to connect to a network on its own. Is a DVR required for controlling this PTZ camera? While this PTZ camera can be controlled from a DVR, a DVR is not required to control the pan, tilt, and zoom of the PTZ-AHD-5 HD PTZ camera. Users can also use the CK-98332 standalone PTZ controller. This controller connects directly to the PTZ-AHD5 using a single pair of RS-485 cable, also known as doorbell wire and controls the camera via protocols such as Pelco-D and Pelco-P.
What is Up the Coax (UTC)? Up the Coax, also known as Coaxatron, eliminates the need to run an additional pair of cable specifically for PTZ control. Rather than using RS-485 controls via 18/2 gauge cable, UTC uses the same cable to transmit the camera’s video signal and PTZ controls. UTC capable PTZ cameras can use single RG59 Siamese coaxial cable to run for video, power, and PTZ controls. Not all PTZ cameras and DVRs support Up the Coax. To use the PTZ-AHD-5 with Up the Coax, we recommend the iDVR-PRO surveillance DVRs.